ORDENANÇA FISCAL NÚM. 1. IMPOST BÉNS IMMOBLES URBANA. ORDENANÇA FISCAL NÚM. 2. IMPOST ACTIVITATS ECONÒMIQUES. ORDENANÇA FISCAL NÚM. 3. IMPOST VEHICLES TRACCIÓ MECÀNICA. ORDENANÇA FISCAL NÚM. 4. IMPOST SOBRE CONSTRUCCIONS, INSTAL·LACIONS I OBRES. ORDENANÇA FISCAL NÚM. 6. CONTRIBUCIONS ESPECIALS. ORDENANÇA FISCAL NÚM. 7. TAXA TRAMITACIÓ ACTIVITATS SUBJECTES A AUTORITZACIÓ. ORDENANÇA FISCAL NÚM. 8. TAXA SERVEI DE CLAVEGUERAM. ORDENANÇA FISCAL NÚM. 9. TAXA PRESTACIÓ SERVEI GESTIÓ RESIDUS MUNICIPALS. ORDENANÇA FISCAL NÚM. 10. 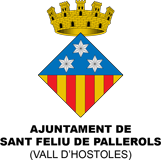 TAXA DELS PREUS PÚBLICS. ORDENANÇA FISCAL NÚM. 11. TAXA SERVEI DISTRIBUCIÓ I SUBMINISTRAMENT DE L’AIGUA POTABLE. ORDENANÇA FISCAL NÚM. 12. TAXA PRESTACIÓ SERVEI TELEVISIÓ PER CABLE. ORDENANÇA FISCAL NÚM. 13. TAXA UTILITZACIÓ INSTAL·LACIONS I DEPENDÈNCIES MUNICIPALS. ORDENANÇA FISCAL NÚM. 14. TAXA EXPEDICIÓ DOCUMENTS ADMINISTRATIUS. ORDENANÇA FISCAL NÚM. 15. TAXA OCUPACIÓ TERRENYS A LA VIA PÚBLICA AMB FINALITAT LUCRATIVA. ORDENANÇA FISCAL NÚM. 16. DEROGADA. ORDENANÇA FISCAL NÚM. 17. TAXA APROFITAMENT ESPECIAL DOMINI PÚBLIC A FAVOR D’EMPRESES EXPLOTADORES SERVEIS SUBMINISTRAMENT INTERÈS GENERAL. ORDENANÇA FISCAL NÚM. 19. TAXA PER LA PRESTACIÓ DEL SERVEI DE L’ESCOLA BRESSOL.